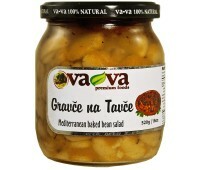 Ingredients: white cannellini beans, onion, peppers (sun dried), garlic, sunflower oil, mint, salt VA-VA's Gravce na Tavce baked bean salad is different from American baked beans in that w..
100% pure acacia honey in a glass jar. 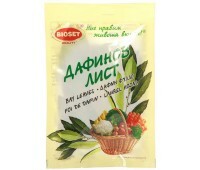 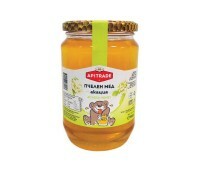 Delicious Bulgarian Honey rich in vitamins and minerals. 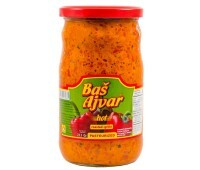 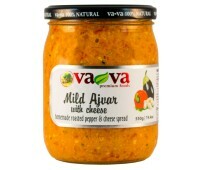 ..
Ajvar Hot Homemade Style Bas - A wonderful roasted pepper vegetable spread, a Macedonian staple. 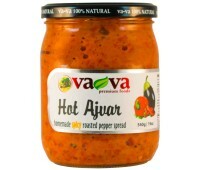 Also served as an addition to meals and it enriches food in the stage of cooking or roasting a..
VA-VA Original Recipe Hot Ajvar - Spicy Roasted Red Pepper SpreadThe Original famous recipe roasted pepper spread! 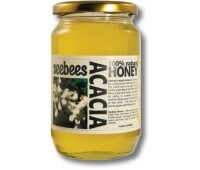 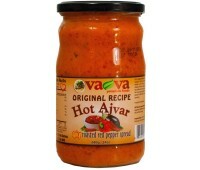 Try it on sandwiches, in pastas or salads, or on the grill; cook it up along.. 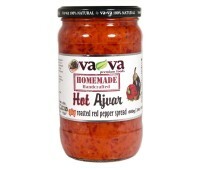 Hot Ajvar 540g VA-VA Premium Foods 100% Natural, All Natural Ingredients:red pepper, eggplant, fefferoni pepper, salt, sunflower No Gluten, No GMO, Low Carbs, Low Fat Product of Macedonia .. 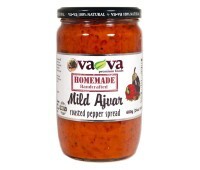 This spicy roasted red pepper spread is made of hand peeled red peppers and a hot, red fefferoni (a type of Mediterranean Chili pepper), and is roasted in an oven and mixed with roasted eggpl..
Ajvar Mild Homemade Style Bas - A wonderful roasted pepper vegetable spread, a Macedonian staple. 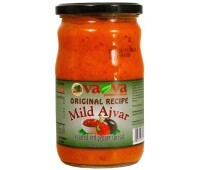 Also served as an addition to meals and it enriches food in the stage of cooking or roasting ..
Hand peeled red peppers are roasted in an oven and mixed with roasted eggplant and garlic. 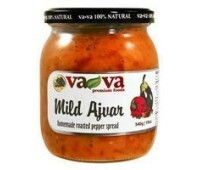 This mild vegetable spread goes perfectly with breads (we recommend French baguette), cheese and cra..
Roasted Red Pepper Spread with Cheese - Hand peeled red peppers are roasted in an oven and mixed with roasted eggplant, garlic, and creamy soy cheese; adding a rich texture to the flavor of t..
Fruit Aronia 200gLatin name: Fr. 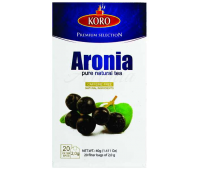 Aronia melanocarpaApplication: Dry fruit has well expressed antiinflammatory and hypotensive action. 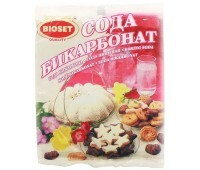 Suitable for hypertension, atherosclerosis, diabetes, thy..
Enameled round baking pan, 36cm in diameter and 5cm deep.Perfect for Bulgarian banitsa, pastry and other Eastern European meals. 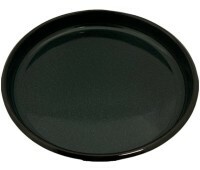 * color may vary depending on availability..
Enameled round baking pan, 40cm in diameter and 5cm deep.Perfect for Bulgarian banitsa, pastry and other Eastern European meals. 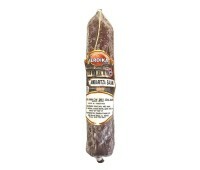 * color may vary depending on availability..
Banski starec - Traditional Bulgarian dry cured pressed pork salami made from premium coarsely ground pork and original spices according to authentic recipes from the mountain region of Bansk..
Bearberry leaves - 100gLatin name: Folium Arctostaphyli Uvae ursi (Ericaceae)Internal use: 1-2 tbsp 3-4 times a day; recommended to be taken with 1 teaspoon of baking soda (amplifies th..
Foraging bees bring pollen back to the hive and pass it off to another worker bee. 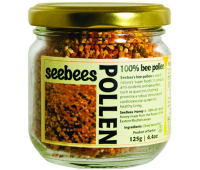 This bee will pack the pollen into a cell with its head. 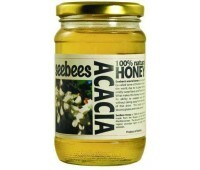 During the packing, the pollen is mixed with nectar.. 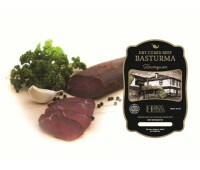 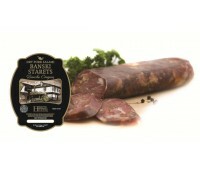 Traditional Dry Cured Pastarma ( Bulgarian style Basturma ) made from Premium Beef according to authentic family recipes. 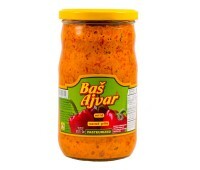 Coated with paprika and traditional spice mix. Made in USA by Hebros ..
Usage: Supports the functions of the respiratory tract. Helps the body fight cold and cough of different types.Ingredients: wild thyme herb, basil herb, peppermint leaves, marshmallow roots, .. Supports normal function of the nervous system by promoting normal heart rhythm in conditions of nervous exhaustion. 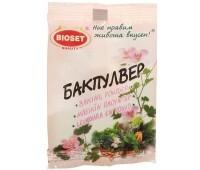 Favors relaxation of the body for more fulfilling lifestyle. 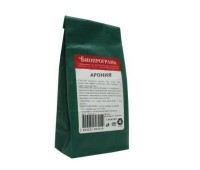 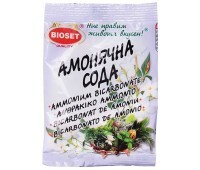 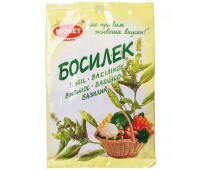 Cup of herbal..
Usage: Favorably affects ill health as a result of overeating, helps for good metabolism. 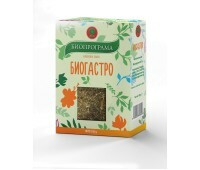 Support the functions of the gastrointestinal tract, promotes normal function of the digestive system..